While out today, wearing my baby in her mei tai carrier, I bumped into another mum I know from a baby group. She commented on how nice the carrier was and that it must be nice to be hands free. She also told me she had been thinking about getting a carrier herself but would be forever taking her son in and out of it to feed him during trips out because he eats so often. Very proudly I said to her: “my baby’s feeding right now!” Needless to say she was really surprised as she hadn’t realised it was so easy and discreet. Feeding in a carrier or sling, once mastered, is an art you’ll find incredibly useful while out and about because it lets you feed your baby quickly and easily as often as she needs. I personally find mei tais the easiest carriers to feed in. You just untie the straps and pull to loosen them enough to enable you to shift your baby downwards slightly, latch her on, then retie. Putting your hand through the underside of the straps to lift and support your breast may also help. A purpose made breastfeeding top or a top you can lift your breast up and out of works best. Remember to securely tie the straps once your baby is in position and shift her back up, again retying, when she’s finished. Because ring slings are so adjustable they are ideal for breastfeeding. Loosen the sling to carefully bring your baby down to breast height or use a cradle position. The great thing about ring slings is that the tail can be used as a cover, to make feeding super discreet and easy. If your baby falls asleep after feeding in a ring sling, it’s really easy to lift her out and lay her down without disturbing her if needed. I can’t speak from personal experience but I have a close friend with an Ergo who tells me they’re easy to feed in. Your baby is upright, like in a mei tai, so feeding in this position can be helpful for babies who have trouble bringing their wind up. A good soft structured carrier should be very adjustable so just adjust the shoulder straps to give you the slack you need to latch your baby on. If necessary shift the waist strap down slightly. A front cross carry, or hug hold, is the easiest way to feed your baby. Often you don’t need to untie the wrap in order to shift your baby low enough to latch on. You may prefer to lift your breast to your baby. The fabric which comes over your shoulders should help to cover you and support your baby’s head while she is nursing. 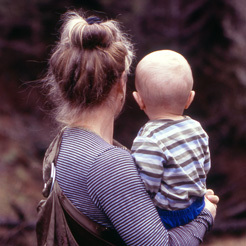 Whenever you make an adjustment to your sling or carrier, always hold the baby securely, supporting her head at all times. Always ensure your baby has enough space to breathe through her nose while feeding. If you have large breasts you may need to hold them with one hand while you’re nursing in the carrier. The first time you try feeding your baby in a carrier make sure you have somewhere to sit down comfortably. It’s best to practise feeding at home before you do it on the move, then once you’re confident you can feed anywhere. It may seem difficult the first few times but persevere as it really does get easier.